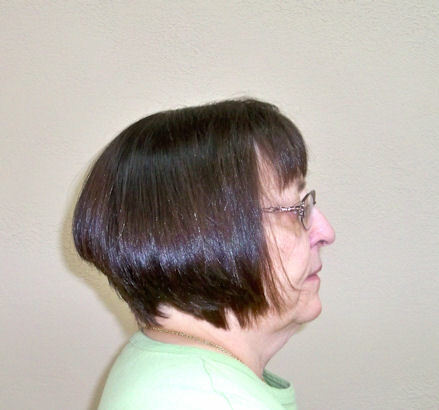 ATTENTION FELLOW PODCASTERS… NONNIE ALERT !!! One of my PET PEEVES is when I load from iTunes or direct from a blog post the podcast MP3 file goes anywhere but where I want it. 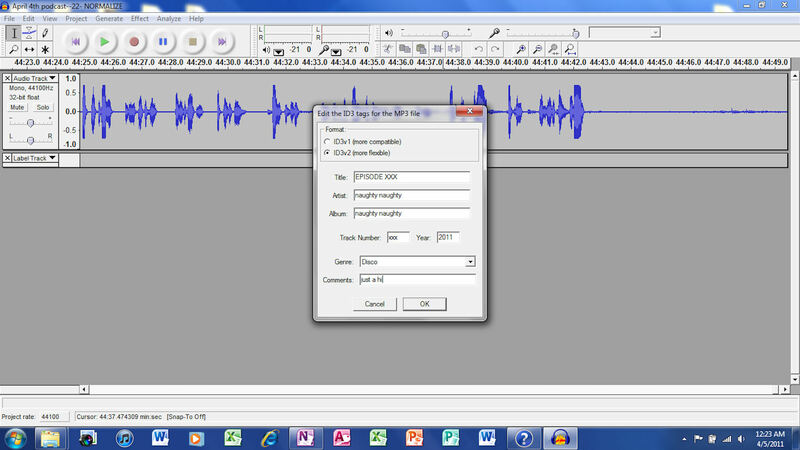 For computers the iTunes downloads and MP3 files downloads from the web page are dependent upon how the podcasters saved the file to MP3 as the final step of recording the podcast. If the PODCASTER are not consistent in recording the information in the INFORMATION TAG FOR THE MP3 FILE, iTunes and your computer can not organize and then find the file on your computer. Each box on the INFORMATION TAG must be filled out correctly and consistently or iTUNES, your computer WINDOW MEDIA PLAYER will not know where to file the podcast on the listener’s computer. The MP3 files end up in the DREADED UNKNOWN ALBUM. 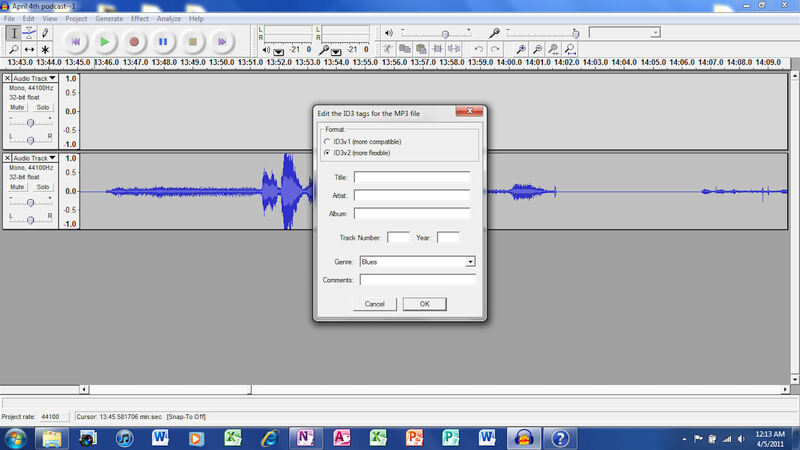 THE LISTENER then have to edit the information in order to get the MP3 file into the same albums. <COMMENTS: I leave blank as I do not find it helpful when I download the information. What is important is that the INFORMATION BOX is filled out consistently the same for those listener downloading to a computer. That is how the podcast get organized to the computer. This may also be true for MP3 players and iPods but I do not know. Make it easy on your listeners and they will love your for it. .<FYI…. JUST MY OPIONION BUT I GOT THESE TIPS FROM A COMPUTER GEEK…. A TEENAGER! 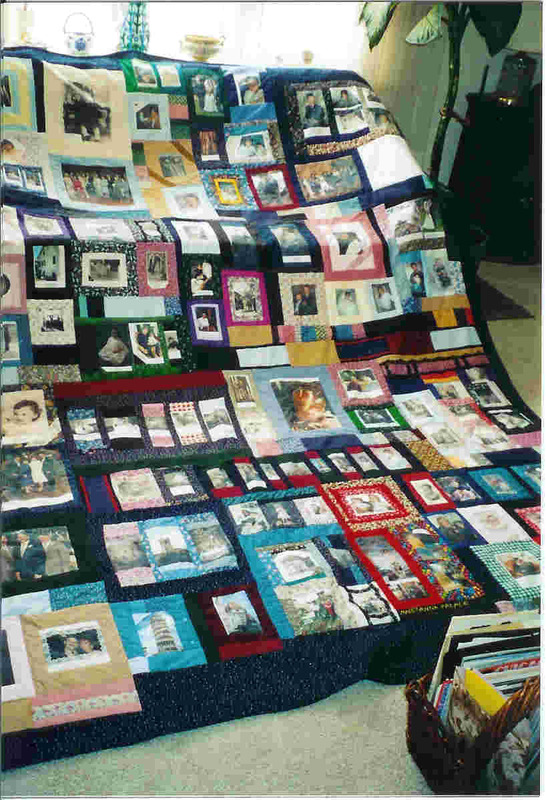 This quilt was designed and machine quilted by Lisa Burmann of Burmann Studios in Metamora MI. Links are below. Stop by at Lisa’s blog to see her other work. Recently Lisa has had a quilt block accepted in the Barn Block Challenge. 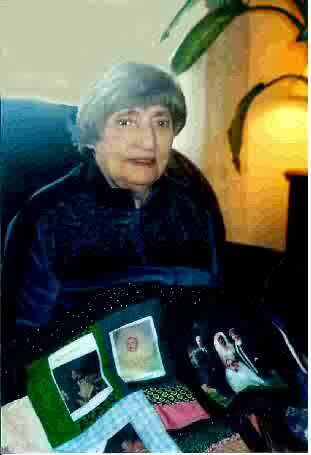 She was also acknowledge by Patsy Thompson for quilting one of Patsy’s quilts. 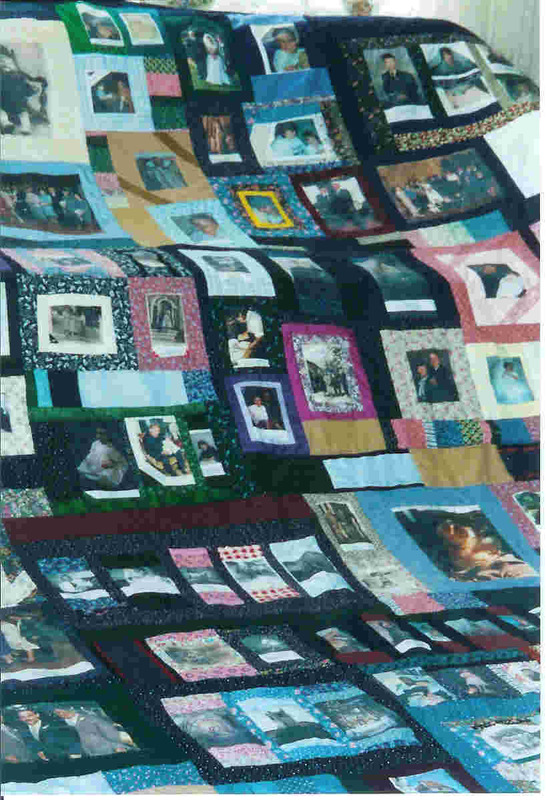 Link to Lisa’s Quilt pictures Patsy Thompson. Getting ready for quilt market. I think Lisa is an up and coming machine quilter who will be winning awards in the BIG SHOWS some day soon. 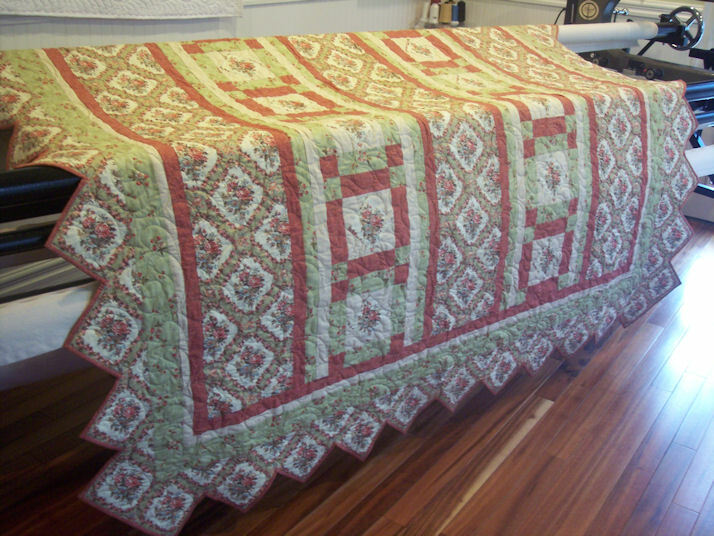 Check her blog and see some great machine quilting. 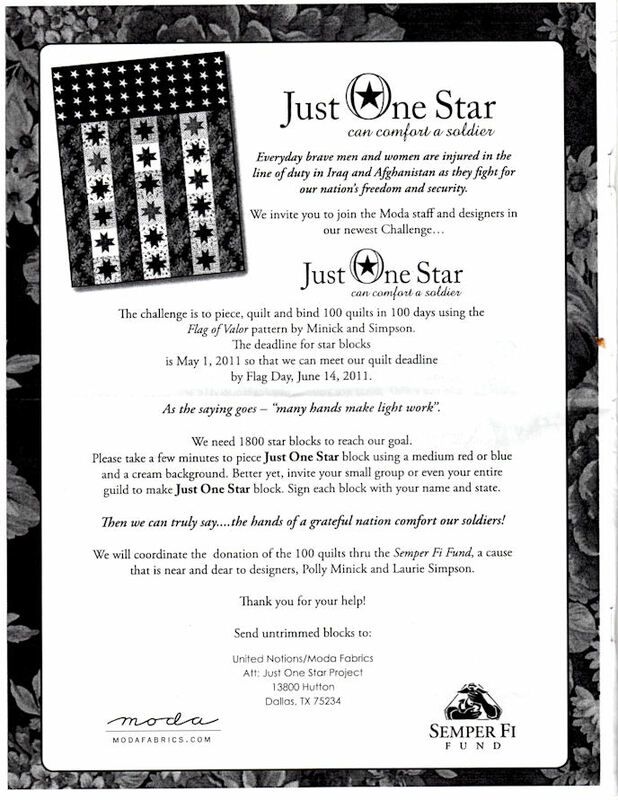 Just One Star—- a call for STARS !!! As a former service member I strongly support this cause and I hope everyone who reads my blog and listens to my podcast will send in a star. YOU can copy the flyer and the pattern to your computer by RIGHT CLICKING and save the image. That will make it easier to read the instructions and pattern. FYI: I had to insert extras spaces in the link for the PDF file as I would have to upgrade my site in order to post the link for th PDF file. Remove the spaces. Better yet GOOGLE …. MODA FABRIC / JUST ONE STAR and multiple links will be given. This book was published in England. This is a 2005 revision of a book originally published in 1988. The basic premise of this book is to use embroidery as the hand quilting to add another decorative dimension to your quilt. Ms Tinker reviews tools, threads, thimbles, needles that should or should not be used. 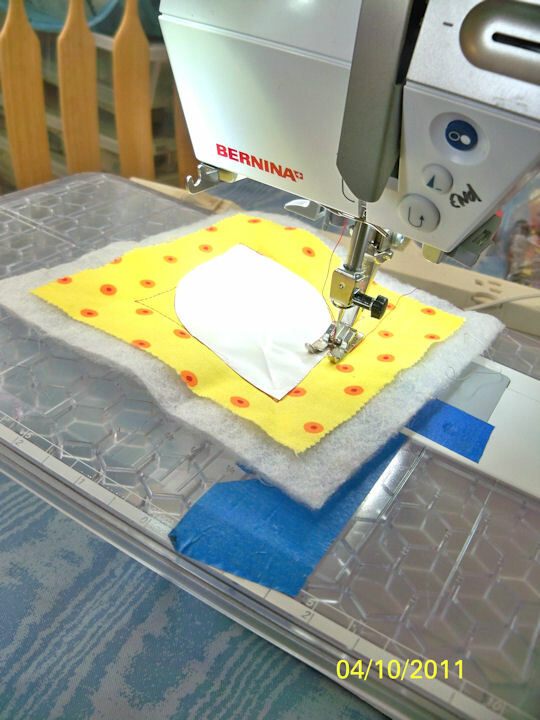 There is a beginners sample of various stitches that can be used to embroider and quilt the project through three layers at the same time. Ms Tinker states this is just a beginning of the process, she suggest exploring old needlework books for other stitches and embellishments ideas. The actual stitches shown are lovely but the pictures of the completed projects are simplistic and dated in appearance. Since this is a reprint of an earlier book I was disappointed not to see updated pictures of any recent projects. The lack of updated projects is my biggest complaints about books that are reprinted. Dated projects are presented without any updating. The projects themselves are nice. Satin pillows, wall hangings and a quilt as you go quilt. 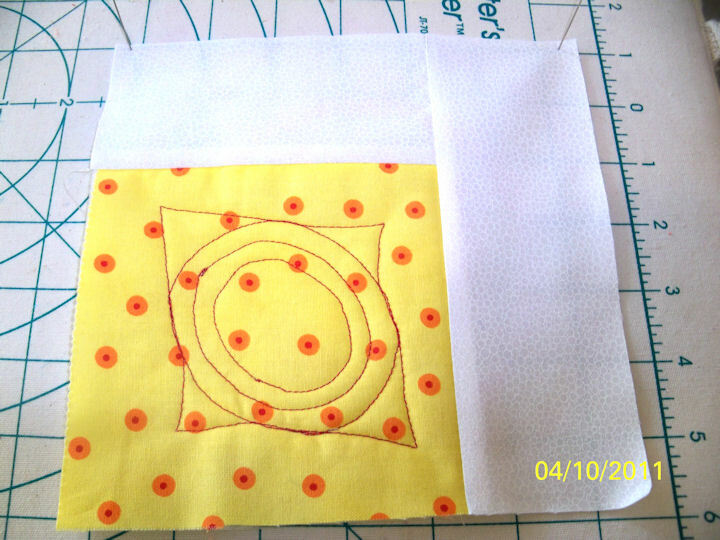 She shows you how to make small embroidered blocks that are attached using sashing. I loved the stitching the book and recognized many of the stitches. My other complaint about this book is that none of the pictures show the backs of any of the projects. 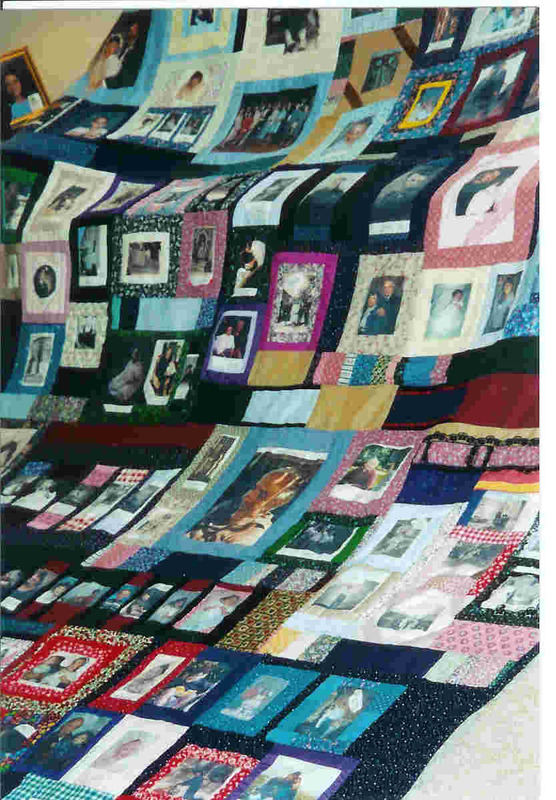 I often wonder why books and magazines do not show the backs of the quilts. I would be interesting in seeing the backs of the projects in this book in particular. Embroidery does not look like hand quilting on the back. Some times it can be actually messy looking. I know my mom tried to drum “correct” technique with the back looking as nice as the front of my stitching but I was not always successful. I have done some hand embroidery on a mix media quilt. The way I handled the issue was to quilt using a stab stitch technique to quilt the three layers while maintaining the embroidery on the top of the quilt. I do very little hand quilting due to lack of time but I find I enjoy thread painting and hope to do more in the future. I was felt I got a good deal on the book. I will post a link for the book when I find it again. Now for a segway, It is my understanding that in England has a long and involve process for learning and becoming certified in needlework. A student / stitcher studies various type of needlework and then get a certification. Some classes are restricted in that you have to have certifications in a technique before you are accepted as a student into advanced classes. It is my understanding that education of needlework is much more formalized then it is in the USA. If anyone knows any more please leave a comment in my blog as I am interested in learning more. Do you know what is a big surpriSe to me. The new books are about $15 but the used books are for sale for $65….. GO FIGURE. Experimenting going on…. MAD QUILTER AT WORK. …..
Supplies need for this exeriment. Scrap batting, cut slightly larger than your charm. Contact Paper to make templates with. Cut them out the same method as making paper snow flakes. Mine will be 3-1/2 inches to 4 inches in size to fit inside the charm. 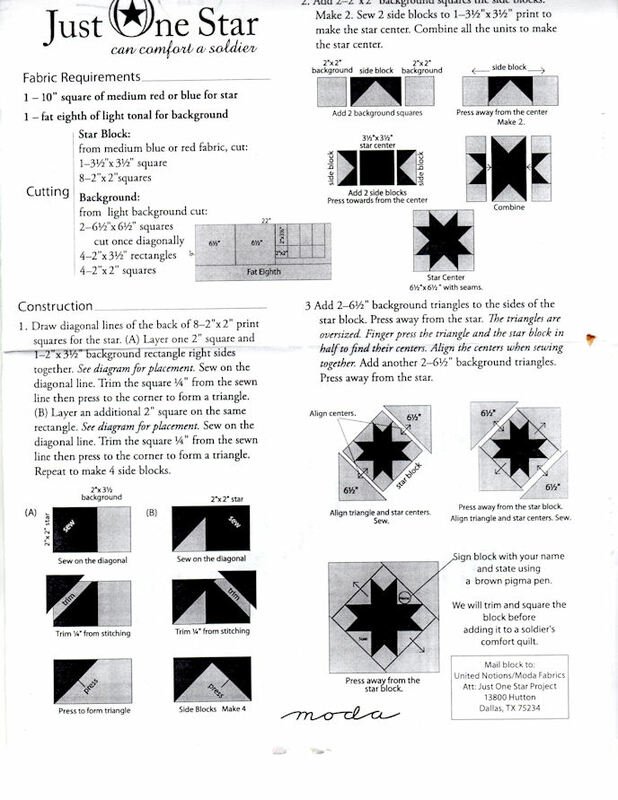 I use this technique on full size quilts and under. ( MOSTLY BABY QUILTS.) I am using it here on a FALSE TRUPUNTO CHARM QUILT. Each charm will be backed with batting and then the sashing will be sewn on per usual. I will then assemble the block, layer over a batting and then proceed to quilt as desired. I will be posting more pictures of this quilt as I progress. Who knows it might be a big failure. 1./ Cut out templates from the contact paper. I find it best to make practice shapes on regular paper then recut out using the contact paper. Be sure the template fits pleasingly within your charm. 2./ Press the charm on the center horizontal and verticle of your charm by folding in half and pressing lightly. You can also fold on the diagonal. This is useful to place your templates evenly on the charm. 3. Place your template on your charm, then sew around it. 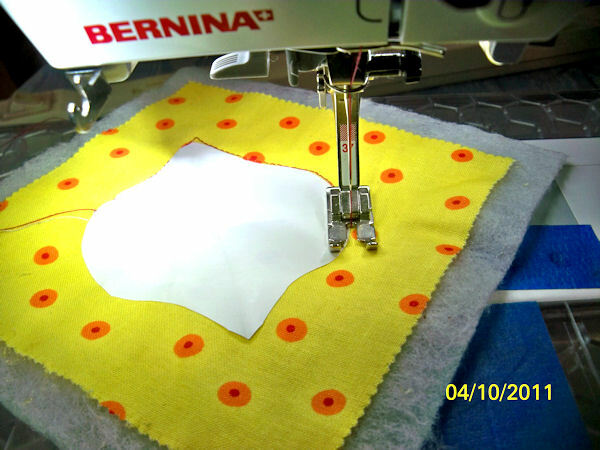 You can sew around a second time by peeling off and realigning the template in a new position. Or you can use another shaped template. It is up to you. 4. 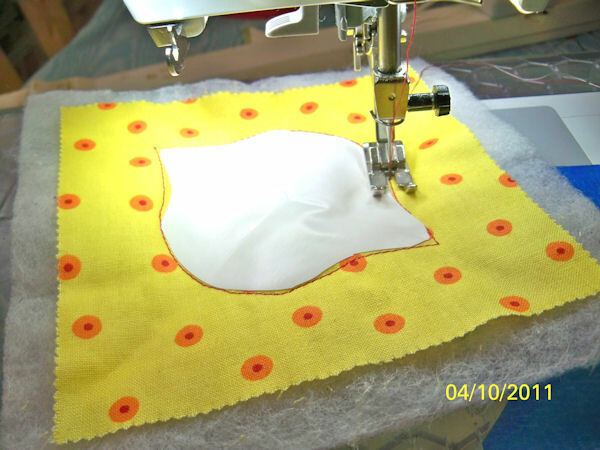 To start and stop… I find it best to start the sewing with really small stitches about 6-8. 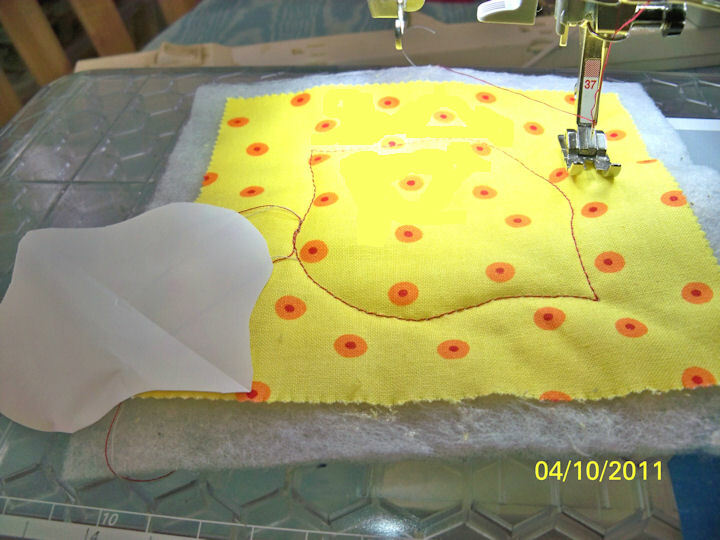 I then increase my sewing stitch to reqular quilting size 10 to 12 stitches per inch. 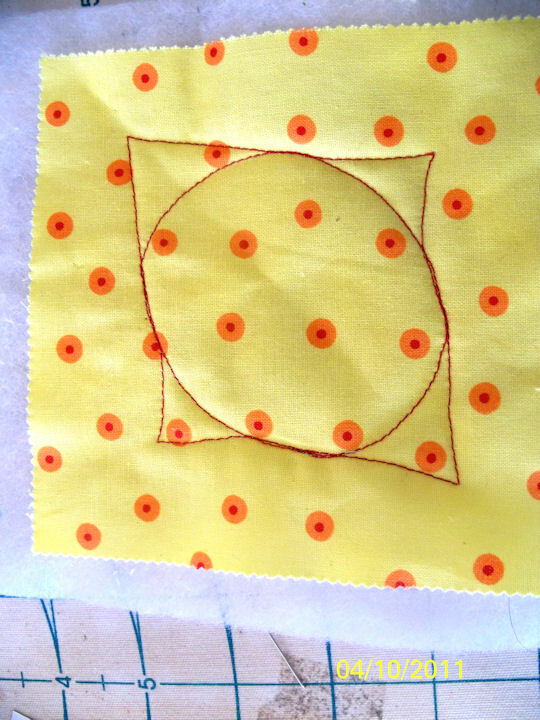 Sew around the template and stop when you reach the small stitching. 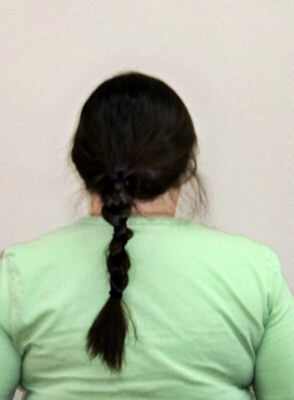 I take the tails to the back and knot the thread. I have tried sewing tiny stitches at the end but it usually looks very lumpy. Sew around the contact paper template being careful not to sew through it. I can see I have been out of practice and I need to work on my stitching… but as I have said before… I POKE OUT THE EYES OF ALL QUILT POLICE. This block will be burried in a corner where no one will see. And I will get better with practice. This is what happens when I sew around a three year old, who likes to push buttons. PLACE THE SECOND TEMPLATE, SEW AROUND IT. I was not happy with my template, I had made cuter ones in the past. I had lent my book and walking foot to my girlfriend who is on a week long quilt retreat. ( Long story, do not ask.) 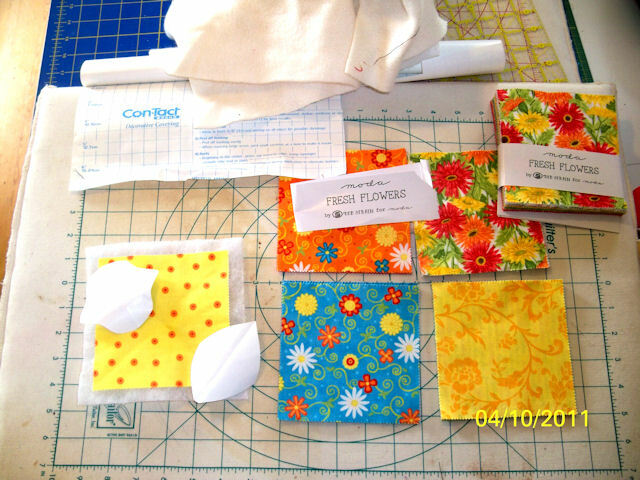 I am using my regular quarter inch foot to sew around the contact paper templates. DO NOT SEW THROUGH THEM AS THEY ARE HORRIBLE TO PULL OUT! ! ! White 2-1/2 inch sashing to be added to each block. The batting is sewn in. Mary Mashuta’s FOOLPROOF MACHINE QUILTING (domestic) Using a Walking Foot This is one of my favorite techniques. I use it often when I want to make a quilt baby quilts. The quilts I do not take to a quilter. 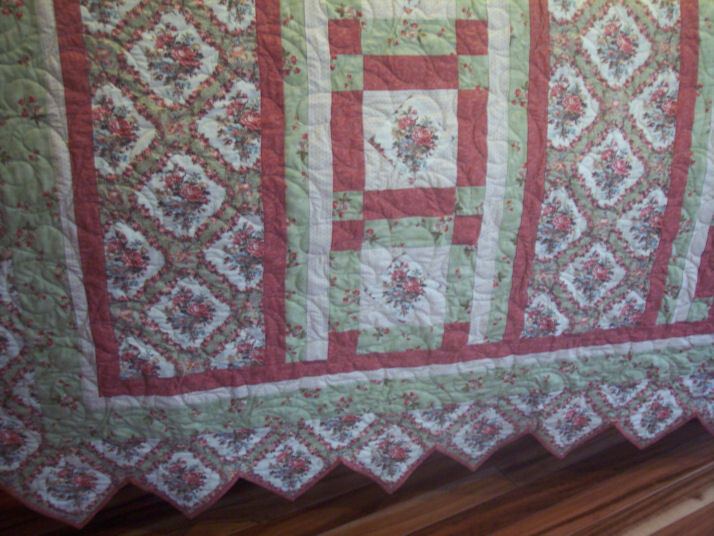 This was my second quilt but the first one was made 25 years prior. 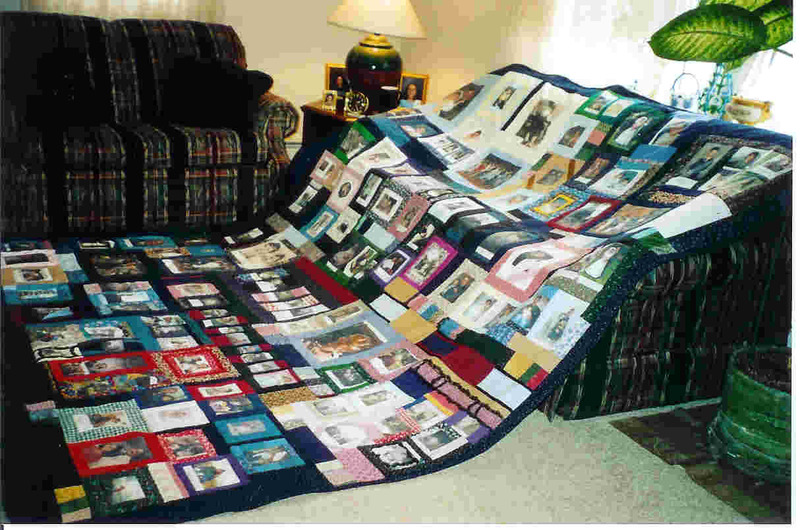 This quilt started life as a full size quilt. But as various family learned of the project they brought me pictures they wanted included. It has FIVE generations of the family. Old pictures from the 1940 and 1950 of my parents and grandparents in Italy. Pictures of my brothers and sisters growing up. Weddings with all the family. I appliqued or photo shopped over divorced spouses. Some blank spaces were left for the children that were yet to be. I gave it to my mother the year after my dad died. She kept it with her until she passed. It covered her coffin. My daughter now has it tucked away to save for her own house, she says. …… . I finally got my hair whacked off after growing it for three years for LOCKS OF LOVE. 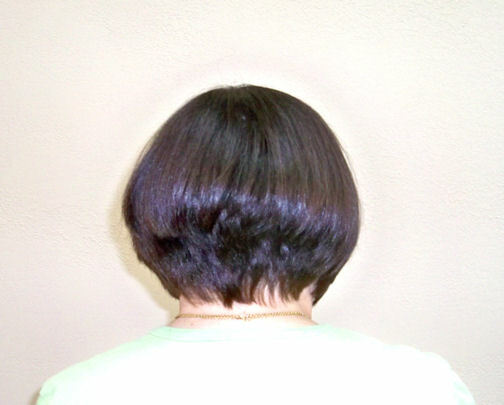 11 inches was cut off …. I feel like I lost 10 pounds…. NOT ! ! ! I am proud to say this is still my natural color. GOOD GENES since my mom did not turn gray until she was almost 70 years old and then it was a beautiful salt and pepper. I did inherit the traditional Italian nose from both of my parents. Some call it Roman… I just call it large.